Over the past few years there have appeared many personalities seeking to use the power and leverage of the tube and social media to catapult themselves into the spotlight, draw in audiences and cut the general people off from the people of knowledge, the major scholars, by presenting themselves as scholars for the people. All of this in the name of Salafiyyah. However, it quickly becomes clear that they have calamities with them, have little fiqh (understanding) of the Salafi aqidah and manhaj, and their histories are dubious - having recently left grave-worship and extreme sufism or having studied under deviants and hizbees such as the Takfiris and Ikhwanis. Two figures who are representative of this are "Ustadh" Abdur-Rahman Hasan and his student Abu Taymiyyah al-Jeylani - an ambitious youngster who only recently left the mires of grave-worship and is now pretending to be an established scholar (pictured right). To see an example of their ignorance and following of desires, refer to this article which documents "Ustadh" Abdur-Rahman's claim that the Prophet (sallallaahu alayhi wasallam) praised the Kharijites and the subsequent disgraces he fell into in trying to defend himself, and likewise the involvement of Abu Taymiyyah in trying to defend his teacher upon ignorance and in falsehood. In this article, we see another major calamity in the subject matter of aqidah, this time from a student of Abu Taymiyyah, who himself is a student of "Ustadh" Abdur-Rahman. It would be useful for the reader to read the following four part series as it will allow the reader to immediately grasp the nature and direction of the contents of this article and it will allow us to be brief and concise without having to go into too much detail. The background issue is the same and relates to the underlying foundation(s) of the deen of the Jahmites of old. And one can also study this article which will give a good background context: Ahl al-Sunnah, the Philosophers and Ahl al-Kalaam on Allaah's Actions and Origins of the Universe (see here). In the video (pictured), Abu Muawiyah, described as a student of Abu Taymiyyah tackles the subject matter of Allah's existence and the origin of the universe. He is heavily influenced by the same rhetoric and kalaam found in the speech of Hamza Tzortzis - in parts he uses the same citations and same examples and illustrations as presented by Hamza Tzortzis in some of his polemics. Before we analyse his speech, some brief background is necessary. Allaah, the Sublime and Exalted is eternal, He is eternal with His Essence, having no beginning. Likewise He is eternal with His attributes which have no beginning. As many of his attributes are tied to His will and choice and many of His attributes are transitive (muta'addin) then this leads us to the belief in the obligation (wujoob) of the eternality of Allaah's actions in the past and future. And following on from this, we believe in the permissiblity (jawaaz) or possiblity (imkaan) of and endless chain of events in the past or future, because by Allaah being eternal and being one who speaks and acts through choice and will, then it is permissible and possible for there to be an endless chain of events (each one by preceded by its own non-existence). This is referred to as (قدم نوع الحوادث), eternity of the genus of events (without any specific one being eternal). So in essence, this matter is fundamentally tied to the issue of Allaah's actions and His will, which are in turn tied to Allaah's attributes and in turn to Allaah's essence. The texts of the Book and the Sunnah indicate the permissibility of an endless chain of events in the past, and this is what the Salaf were upon as is clear in their refutations against the Jahmiyyah on the issue of kalaam (Allah's speech) - the most clear example of that is the saying of Imaam Ahmad in refutation of the Jahmiyyah, Mu'tazilah and Kullaabiyyah (لم يزل متكلما إذا شاء), "He has never ceased being one who speaks when He wills" and likewise the explanation of Ibn Abbaas (radiallaahu anhu) of verses that are in the form of (وَكَانَ اللَّهُ غَفُورًا رَّحِيمًا), "And ever was Allaah forgiving" (48:14) with the meaning that Allaah has never ceased being as such. However, the Jahmiyyah and Mu'tazilah opposed this foundation in their attempt to prove the universe was originated, and they spoke with the impossiblity of an endless chain of events in order to allow them to validate their kalam argument (hudooth al-ajsaam, known today as the kalam cosmological argument), and this then had implications on Allaah's attributes which in turn had implications on the creation of the universe, how and through what did it come about - as it relates to Allaah's Speech and action - and from here sprang the innovations of the Jahmiyyah, Mu'tazilah, Rafidah, Kullaabiyyah, Karraamiyyah, Ash'ariyyah and Maturidiyyah in the subject of Allaah's names, attributes and actions and the emergence of beliefs and statements of kufr and zandaqah on account of this kalaam. It was around these affairs that the Salaf authored books and wrote against the Ahl al-Kalam, scorned them, reviled them, condemned them and warned the Ummah against them, Shaykh al-Islam wrote extensively on these matters many centuries later. The mistake in all of these groups was that they wrongly believed that the only way to validate Islam, the Qur'an and Prophethood was through the argument that the universe is originated, thus proving Allah's existence and then everything follows on from that. This is a false premise. The existence of Allaah is not dependent on proving the universe had a beginning and is originated. Rather, the proofs for the existence of Allah an innumerable, varied and diverse as indicated by Ibn Taymiyyah (see here). However, the people of kalam made the veracity of Islam to be dependent upon this flawed proof comprising false premises and as a result, they got embroiled in centuries of wrangling with the Philosophers and never managed to refute them sufficiently and in turn brought damage to the creed of the Muslims. Today, the Internet and social media has opened up the avenues of interaction, argument and debate and unfortunately, many Muslim polemicists - and some of them claim attachment to Salafiyyah whilst ignorant of the details of the Salafi aqidah - are resorting to the methods and polemics of the blameworthy and condemned people of kalam in their arguments against atheists. They fall into this because they are not really grounded in the Salafi aqidah and they are not competent in these matters. In his video, the student of Abu Taymiyah says the aim of his video is discuss the claims of atheists and also provide the listener with the "tools to combat these doubts" (0:56). He says he will mention four topics, and the one he puts first is the "cosmological argument". He proceeds to give an example of an infinite number of "Bobs" (people) in the room he is sat in and if he was to come in the room and take five "Bobs", the question is asked, how many "Bobs" are left in the room? He says, mathematicians will give one answer, an infinite number of "Bobs" and logicians will say infinity minus five. He says that nothing prevents him from taking five "Bobs" out of the room and so the question of what we are left with leads to absurdities and contradictions. ... which shows as the famous Greek philosopher Aristotle said, "Infinity is a potential, never actualised." Then he proceeds to give his examples, the first is that if the universe had an infinite past we would never reach the present moment and the second is that if was to step on a bus and was a pound short and asked the person behind him if he could borrow a pound, and then that person asked the person behind him and so on to infinity, he would never actually get on the bus, because there would be an endless chain of people requiring a pound from someone behind them, and this is the same for the universe. ONE: His statement, "We know that the universe began around 14 billion years ago. But the question nobody seems to be able to answer is what caused the big bang..." There is no knowledge that establishes the universe began around 14 billion years ago and that "a big bang" was its starting point. This is pure conjecture and fancy of the atheists and naturalists and this figure has been derived at through assumption upon assumption. Refer to the paper on Big Bang Cosmology for more details on this matter (see here). Using the kalam cosmological argument pushes polemicists to affirm the big bang model of cosmology (as a means of validating the argument) and in doing so, they enter into a deeper ditch than the one they were already in. This is because the big bang model is futile, false and baseless. It is all founded upon conjectures and assumptions, and is only promoted because it is part of an inseparable package consisting of cosmic evolution, geological evolution and biological evolution. The time-scales have been carefully engineered and fixed (fudged) to allow cosmic, geological and biological Evolution to be accounted for within the materialist, naturalist belief system. TWO: He does not distinguish between the impossibility of an infinite chain of dependent causative agents (التسلسل في المؤثرين أو الفاعلين) or dependent causes (التسلسل في العلل الفاعلة) and an infinite chain of events (التسلسل في الآثار) and speaks of them all in one and the same speech. His speech in negating an infinite chain of past events is very explicit. He says, "So what is an infinite regress, an infinite regress is an infinite chain of past events...But does an infinite history of past events really make sense in the real world... ... which shows as the famous Greek philosopher Aristotle said, "Infinity is a potential, never actualised." ... But to further illustrate why an infinite past or why or an infinite series of past events cannot exist in the real world, let me give you a couple more examples..." This is the origins and starting point of the misguidance of al-Jahm bin Safwan (see Majmu' al-Fatwaa 5/541), as this the principle upon which the deen of the Jahmites is founded - that of the negation of the attributes and actions which is logically demanded from the assertion of this premise - if one was to remain true to this argument and all of its necessities. Ibn Taymiyyah is speaking here about this very principle, the claim of the impossibility of an endless chain of events in the past which is the foundation of the deen of the Jahmites and the foundation of the "kalaam" condemned by the Salaf. It is the starting point and the door-opener to a series of steps that lead to the rejection of the attributes and actions of Allaah, the Mighty and Majestic. And the origin of this kalaam is from the Jahmiyyah, the associates of Jahm bin Safwan and Abu al-Hudhayl al-Allaaf and others. They said: "Because the evidence has indicated that the continuous (infinite history of past) of events is impossible and that it is obligatory that all events (collectively) must have a beginning because of the impossibility of an endless chain of events" - as I have detailed in other than this place. And this foundational principle which was innovated by the Jamiyyah and whoever followed them from Ahl al-Kalaam, of the impossibility of the eternality (dawaam) of Allaah's action, it is that upon which they built the foundations of their religion and they made that to be the foundation of the religion of the Muslims. And we have said already: They followed every faction in that which it erred and as for their contradiction then it is because the Mutakallimeen, in (the proof of) huduth al-ajsaam (the origination of bodies, kalam cosmological argument) they depended upon the impossibility of an endless chain of events in the past, this is their (supporting) pillar. And know that those philosophers overpowered the Mutakallimeen, the Jahmiyyah and Mu'tazilah and whoever followed their path, because they (the Mutakallimeen) did not know the reality of what Allaah sent His Messenger with, and they did not use the sound evidences of reason as proof for what they supported (in their view). So these Mutakallimeen fell short in knowing both the revelation and reason until they (began to say): "Allaah never ceased not doing anything and nor speaking with His will, then there occurred whatever there occurred without any newly-arising cause" and they claimed the impossibility of the eternality of Allaah being one who speaks with His will, and then there occurred what occurred without any newly-arising cause, and they claimed the impossibility of Allaah eternally being one who speaks with His will and (one who) does whatever He wills because of their claim of the impossiblity of the infinite (history) of (past) events. Then their Imaams such as al-Jahm bin Safwan and Abu al-Hudhayl al-Allaaf tended (to the view) of the impossibility of (events) being eternal in both the future and the past (together). This corrupt principle which opposes the Book and the Sunnah allowed the atheists and Philosophers to cast doubt on the flawed proof that rested upon it and the discussion of this is a lengthy matter and is outside the scope of this article - you can study many articles on Asharis.Com for more elaborate details. It is clear that Abu Muawiyah is laying down a foundation from the foundations of Jahmites, a principle which eventually led to kufr and zandaqah and tribulations and calamities upon the Muslim Ummah. Historically, these ideas emerged after unqualified people, like al-Ja'd and al-Jahm, were debating and arguing with atheists and philosophers, and they became affected with some of their underlying foundations, invented some of their own and tried to devise arguments on the basis of incorrect premises. These arguments, whilst appearing sound outwardly, were flawed due to these incorrect premises and this caused problems for whoever adhered to these arguments in what came thereafter. Abu Muawiyah's speech is very similar to that of other "Internet personalities" like Hamza Tzortsis and the various online clones who appeared mimicking his polemics, they have been refuted elsewhere on this matter (see this series). 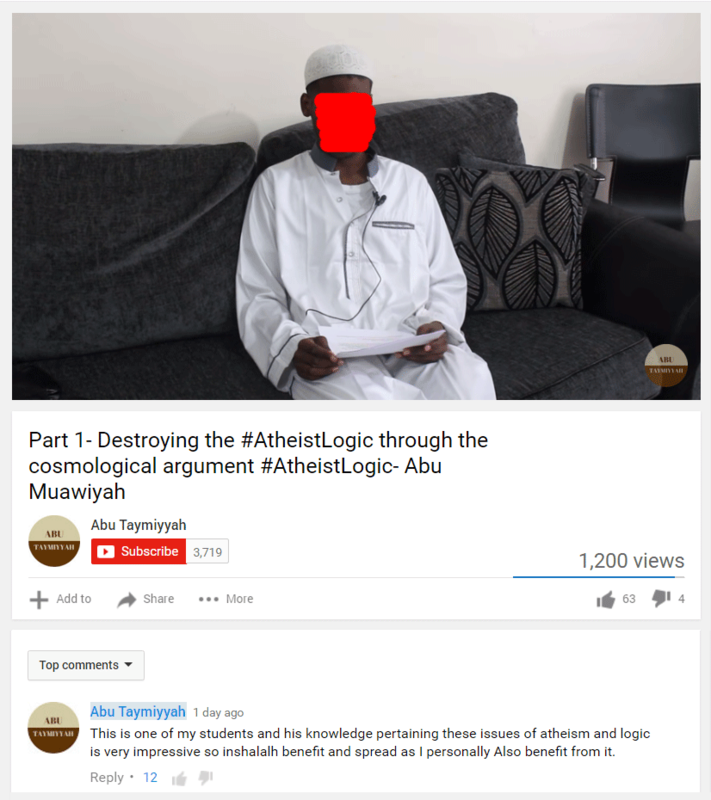 Abu Taymiyah al-Jeylani introduces this individual in his post after he published this video, "This is one of my students and his knowledge pertaining these issues of atheism and logic is very impressive so inshalalh benefit and spread as I personally Also benefit from it.﻿" Indicating that the jahl (ignorance) of the teacher is greater than the jahl of the student. These people are not grounded in the Salafi aqidah and manhaj, and they are a danger to whoever begins to trust them and their knowledge or is amazed by their apparent sophistication and intelligence. They do not have fiqh in the religion and are known for calamities and promoting falsehood and the usool of the innovators and hizbees. See this example where "Ustaadh" tries to undermine principles of the Salafi methodology with Ikhwani, Turathi principles. The danger of these online predators seeking naive and uninformed audiences who they can ensnare into their traps. So "Ustadh" and al-Jeylani are recruiting their audiences into their online learning platform and the reality is that these are pseudo-scholars not fit for teaching and they are established as dishonest people. This is proven clearly in this article which documents their lie against the Prophet (sallallaahu alayhi wasallam) with respect to the Kharijites and their subsequent disgraceful attempts to justify it, despite all evidence to the contrary.